The expansion of Highway 151 to four lanes between Beaver Dam and Fond du lac forced the Town of Waupun to identify an alternate site for its Town Hall and Maintenance Garage. 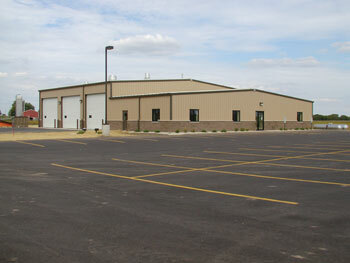 After identifying a site, the Town of Waupun retained Kunkel Engineering to design this multi-purpose facility. Additionally, Kunkel Engineering worked with the township leaders to secure some $556,000 in funding from the Wisconsin Department of Transportation, covering some 84 percent of the overall project cost. The 8,000-square-foot facility is a pre-engineered structural steel building with a four-hour rated fire wall separating the Town Hall and offices from the Maintenance Garage. Construction began in January 2000 and was completed by September of the same year.